The Payments section is separated out into 2 tabs - Collections and Disbursals. 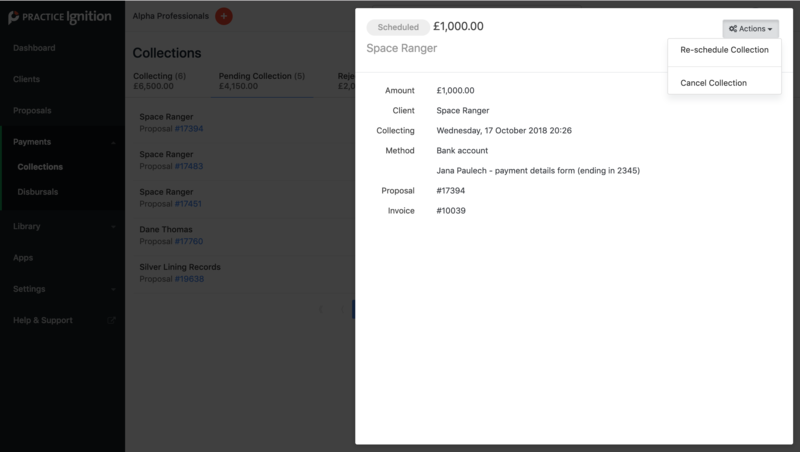 The collections tab shows all individual payment transactions across your entire client base and the status of the collection. The collections tab is broken into three key sections based on status; Collecting, Pending Collection and Rejected. If you are in the USA, you'll also see a 4th tab, Verifying. 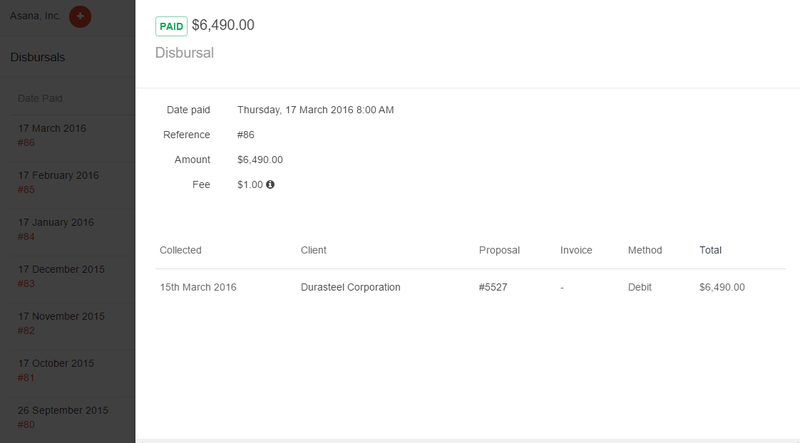 The disbursals tab shows the release of funds into your account once they have cleared. Read on below for a breakdown of each tab, and the status sections. The collections tab is the best place to view all transactions across your entire client base. In the top right corner of the screen, you can export a CSV file of all transactions that are collecting (or pending collection). PI Pro-tip: If you prefer to view all historical collections for a specific client, you may want to view the client payments tab within their client record. For a view of payments related to a specific proposal, you may choose to view the Invoices & Payments tab of said proposal instead. Disbursing today: If a collection is listed here, it means it has been approved by the clients' bank and the funds are expected to be deposited in your account today. Disbursing tomorrow: If a collection is listed here, it means the bank has approved the transaction but the funds are still being transferred to your account and are expected to be deposited tomorrow. Note: If you view the Payments section on a Friday or Saturday, this section will be called "Disbursing Monday" given that transactions are not processed on weekends. Public holidays can extend this out too. Processing: This means that the funds have begun collecting but have not been approved (or rejected) yet. If you click on any payment in the list, it will open a draw from the side with more information about that transaction. This tab shows all payments that have not been begun processing yet because the collection start date has been scheduled for a future date. If you want to reschedule or cancel a collection that is still pending, click on the transaction and a drawer will open up on the right side. 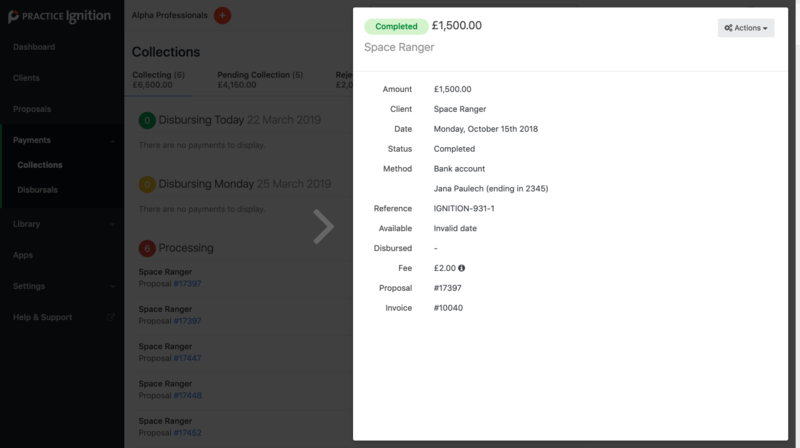 Click on Actions in the top right corner and choose Re-schedule Collection to change the date or Cancel Collection to stop the payment entirely. If you are cancelling the transaction, you'll be prompted to confirm before cancelling. 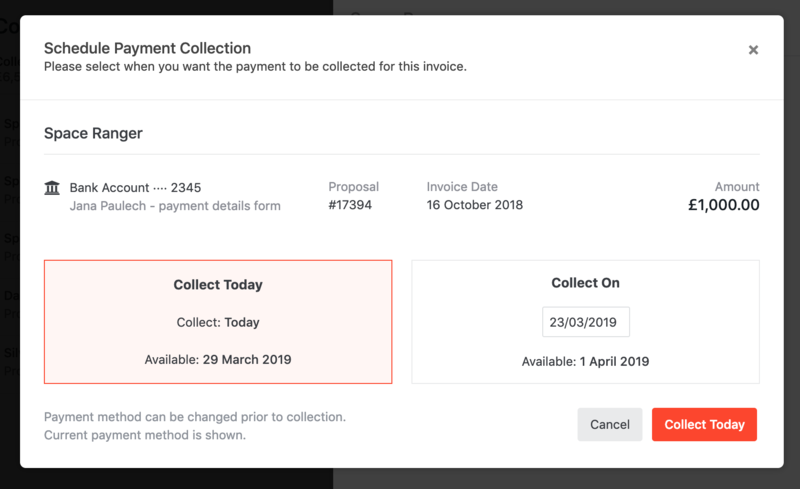 Once you cancel the transaction if you have Xero or QBO integrated, your invoice will no longer be awaiting payment and you can either arrange to collect payment manually, or re-enable the payment collection at any time via Practice Ignition (see our article on collecting payments on invoices created in the past for instructions). This list shows any payments that have been rejected by your clients' bank or credit card provider. Here you can click on a payment to see more details and retry the payment. You can learn more about handling rejected payments here. This list shows all ACH payments which are pending because the clients have not yet completed the micro-deposit verification process. If it has been more than 3 days since the client entered their account details on your proposal and they are still in this list, you may need to remind your client to complete the verification process so that the payment can be processed. See the above link on best practices for handling ACH account verification. Payments that are still in the "Verifying" state can be deleted. if the scheduled client verification email hasn't been delivered, it will also be cancelled. The disbursals tab shows all the lump sum payments that have been deposited into your bank account. The summary view shows the date of the disbursal (plus a disbursal reference #), the number of payments that have been bundled into the disbursal, and the total lump sum value of the disbursal. On the right side of the screen is a summary graph of all funds collected via Practice Ignition. You can choose to filter the graph by specific time periods. 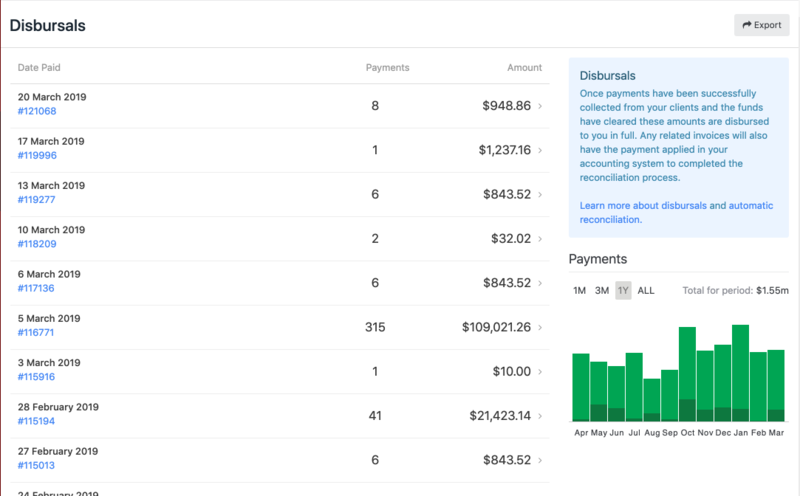 You can also hover over the graph to see the breakdown of collections by the payment method type. In the top right you can export a CSV file of all disbursals records in your account. 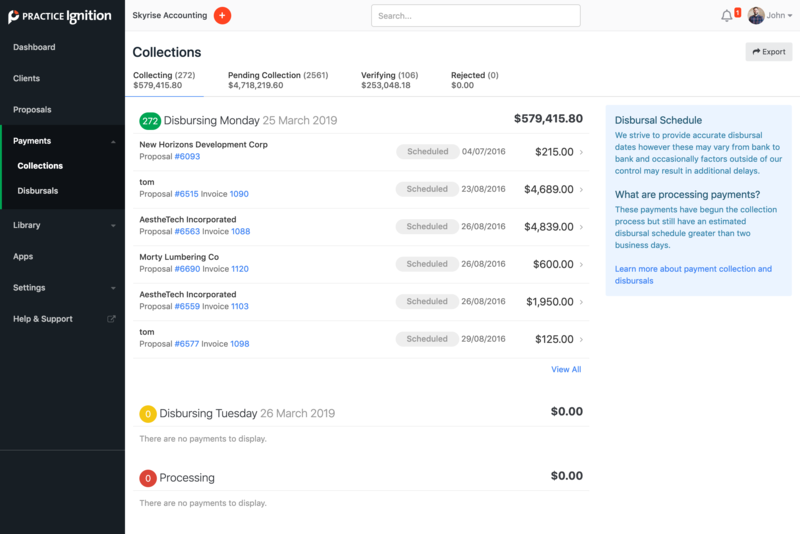 If you click on a disbursal, you will get a draw from the side showing you the collections that make up that disbursal and the invoice number (if you have connected Practice Ignition with an accounting system).